Having been a player during World War II, Adolph Louis Camilli simply went by Dolph. Good choice for the 1941 National League MVP. You don't see these old cards everyday and so when I saw this affordably-priced example on eBay a few weeks back, I snapped it up. This set was produced by the Michael Pressner Company of New York. From all accounts, they were a novelty and carnival supply company, whatever that means. I think they made those toy trinkets you could win at the fair if you could knock over those milk bottles or get the rubber ball in the peach basket. There were a total of 24 cards in the set and they were sold at candy stores in strips of eight. 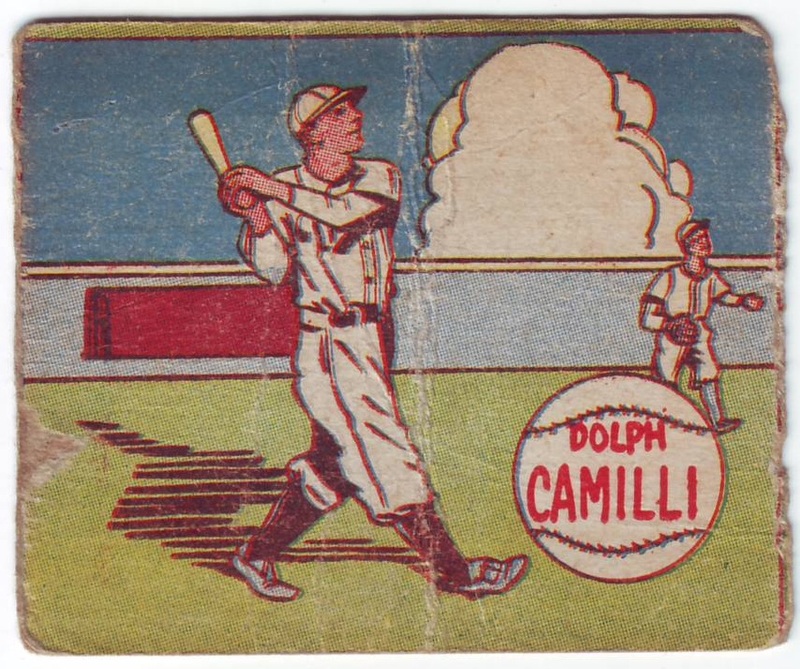 They're significant since they were one of very few baseball card sets produced during the war. Personally I think they are great. They remind me of "Bazooka Joe" comics. I read where someone called these cards among the ugliest ever produced. I disagree. So they don't have fancy graphics or real photography. I bet the kids loved them in 1943, a diversion from what was happening overseas. Similar cards were produced in 1949 using the same cartoon figures. One difference between the sets is that the later was numbered. I'm a huge fan of the white-bordered T206 baseball card. But I think I may be a bigger fan of the gold-bordered T205. Bold colors, player bios, stats, facsimile signatures and team nicknames add to the sets appeal. Some even classify these cards into three subsets: American Leaguers, National Leaguers and minor leaguers. AL cards have this diamond design. NL cards have more of an airbrushed portrait look and minor leaguers have an ornate frame. So far, I have three American Leaguers. A few days ago I bid on a different T205 card. I had never heard of the player and the card was an absolute beater. It looked like it had been run over by a truck. My kind of card. As a veteran of eBay, I figured my bid would hold up. Not even close. I was outbid that same day. With days remaining in the auction. I couldn't believe it! I didn't understand. But then I figured it out: The card was of a minor leaguer. There are only a dozen players in this subset and they demand a premium. And here I thought I was the only one out there looking for poor old baseball cards. I checked my mail twice yesterday. Once on my way to work and once after getting home. That's unusual for me, I'm lucky if I grab my snail mail but once a week. But I was waiting for something special. 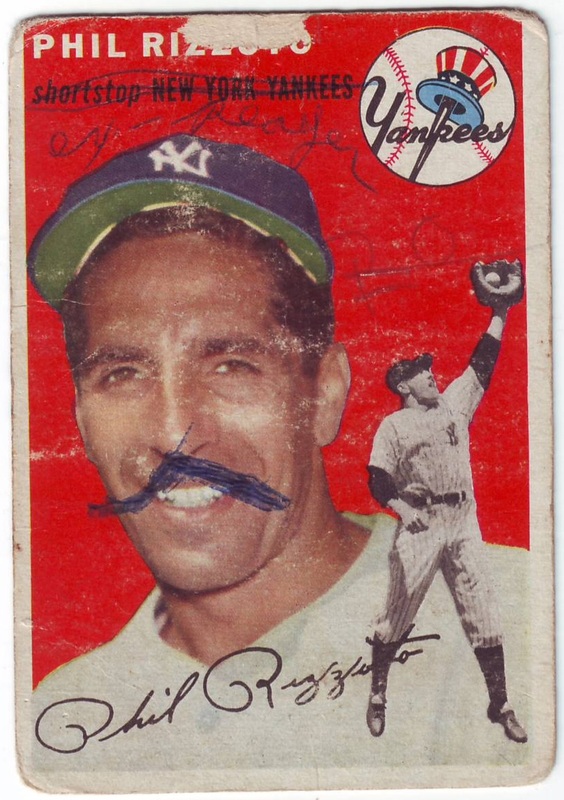 After nearly a week, I was hoping my poor old 1954 Topps Phil Rizzuto was on its way. And when I opened up my mailbox a few hours ago, I was hoping to see one of those padded yellow envelopes I'm sure you've all seen before. That signature yellow usually means another one of my acquisitions has arrived. But no yellow envelope. How could it be? It should have arrived days ago. After digging a little deeper, I found it. It wasn't yellow this time but white. It was a standard envelope with cardboard used as reinforcement. I knew it had arrived. And like a kid in the proverbial candy store that feeling came over me. Ah, for the simple joys of life! 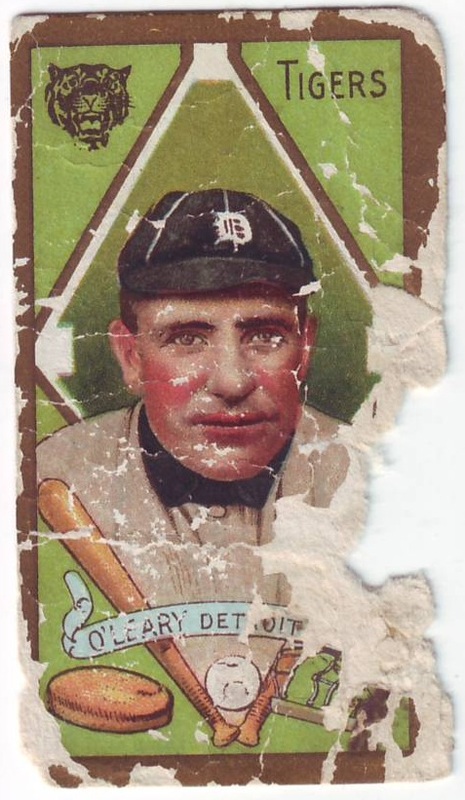 How much would you pay for a genuine 102-year-old baseball card with a corner missing? It seems that over the last few years I am buying all my baseball cards in a bubble. All I want are poor old baseball cards, the worse the better. And because of that I wonder whether the cards I am buying are worth it. Of course they are worth it for personal reasons, but are they worth the money I am spending on them? Sometimes I wonder. This card cost me $10 ($9 +$1 shipping on eBay). A few other things you can buy for $10: A little more than two gallons of gas in California; lunch; a ticket to the movies. When you compare it to some things, maybe a piece of Americana is worth a ten-spot. Usually when I don't know a player I can simply Google him and find out plenty. 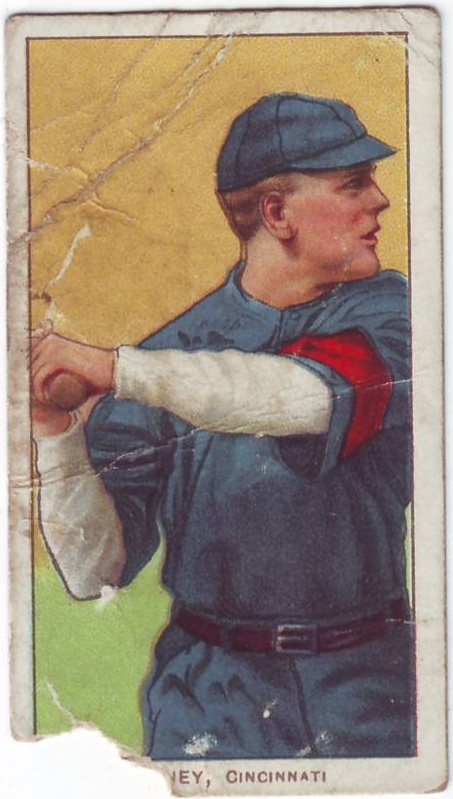 Not the case with the ballplayer on this old card. What I can tell you is that Castaneda was the manager of Club Circulo de Artesanos. The club played amateur ball in Cuba. But I didn't get the info from Google. It was from the back of the thin card. It seems Google has never heard of Mr. Castaneda the Cuban ballplayer. And here I thought Wikipedia had an entry for almost everyone. From the back of the card: "During the off-season he acts in Hollywood movies." 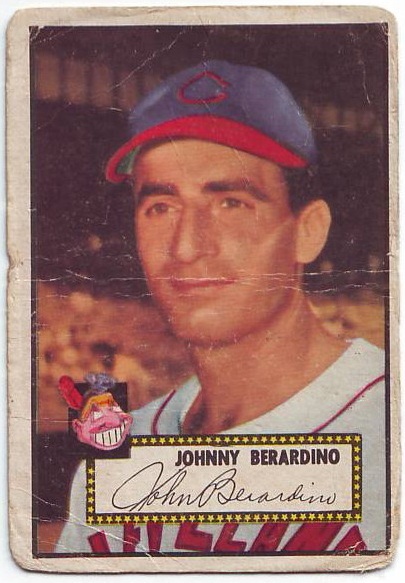 Johnny Berardino's acting name was John Beradino, notice the slight change in his last name. And while he had a part in seven Major League seasons, he missed three season to World War II and won a World Series with Cleveland in 1948, he is best known or his work on the television screen. From 1963 until his death in 1996, Berardino played Dr. Steve Hardy on "General Hospital." Yep, it's the same guy. He even has a star on the Hollywood Walk of Fame. Not bad for life after baseball. So it's been forever since I last posted. Sometimes you've got to just live life. 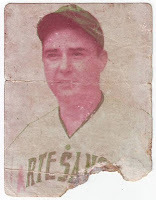 But yesterday, I really started missing posting my poor old baseball cards. It had been a while since I picked up a stack of old cards. A couple days ago I did just that and this card was on top. I bought this card because of Bob Feller. Who am I kidding? I bought this card because of its horrible condition. Tape, stained, torn and dirty. My kind of card. When taking it out of it's protective sleeve, it split in two.Yep, two pieces, right below poor Bob's head. 74 years later, this card is really brittle. I wasn't too bummed though. I figure it's just another chapter in its storied life. If only this card could talk.